The adjustable hiop camber/caster strut mount allows you to independently adjust the camber and caster angles of the front suspension. This allows the sporty driver to fine tune the handling of his car. Precision machined from high quality materials to the highest German standards, the strut mount has a mono-ball bearing mounted in heavy duty Polyurethane which solidly locates the top of the strut, but insulates the suspension transmitted shock/vibration from the chassis. 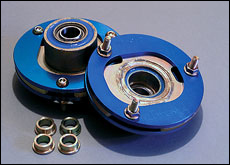 Alternatively a solid mounted mono-ball system is used for race and rally cars.